Beijing, Jan 22: Highways were closed and airport traffic was disrupted as the worst cold in years hit many Chinese provinces. Highways in at least 12 provincial regions of China were closed since 8.00 a.m. (local time) on Friday due to blizzards and snowstorms, Xinhua reported. 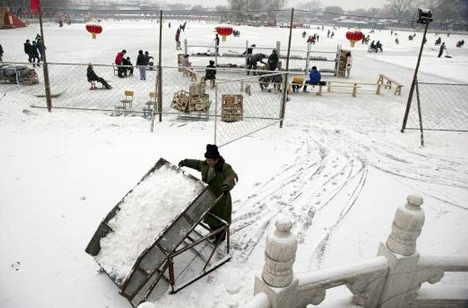 A large part of Jiangxi province was hit by snowstorms on Friday. The airport in Nanchang, capital of Jiangxi province, was closed on Friday morning. Several sections of highway in the province were also closed. Jiangxi’s coldest weather since 1992 is expected from January 23 to 26, according to weather office. More than 44 flights have been cancelled in Zhejiang province, the provincial transportation department announced on Friday. Temperatures in Beijing dropped to ten degrees Celsius below the freezing point on Friday and are expected to hit a 30-year low of minus 17 degrees Celsius from Saturday through Sunday, the Beijing meteorological station forecast. The temperature in Genhe city, located in China’s Mongolia region, dropped to a whopping 47.8 degrees Celsius below zero on Thursday, nearing its historical record of minus 49.6 degrees. Genhe has been called the coldest place in China. Icy fog clouded the street of Genhe, where fish vendors could snap a frozen fish into two pieces. Ergune in Inner Mongolia and surrounding areas have seen temperatures fall to 40 degrees Celsius below the freezing point. Wang Ji, deputy director of the Beijing Weather Centre, said that since January, the El Nino effect has subsided, but a bout of cold from the northern Atlantic and the Ural mountains in Russia has headed south, causing snowstorms in Europe and moving eastward to affect China.